Does Costco Save You Money on Real Food? The past two months, my family conducted an experiment. Could our family of 5 really save money and eat healthy at Costco? Could we keep our food stamp budget and eat even more organic, non-GMO, whole grains, and plenty of fresh produce? Here is what happened. We got our Costco membership 2 months ago. Like our Cheapskate Cooks Facebook Group, I now have mixed thoughts about Costco memberships. When we signed up, I ultimately, wanted to answer this question: Can our family of 5 really save money and eat healthy at Costco? Can we keep our food stamp budget and eat even more organic, non-GMO, whole grains, and plenty of fresh produce? We called it the #CheapHealthyCostco Experiment. While sticking to a budget that our family would roughly receive on full SNAP (food stamp) benefits – $150/week. I know that may seem like a generous budget. Since we started with $25/week, $150 blows my mind. 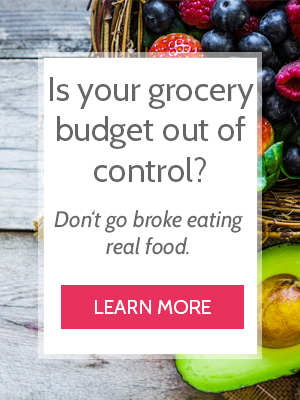 On the other hand, if you are feeding a family of big eaters mostly real food, and you are trying to source organic, local, and non-GMO products, this budget might seem too small. Everyone is different and there is no right number. This budget works out to $1.42 per person, per meal. Since we rarely go out to eat (with the exception of several of Chris’s lunches at work), and since most of these meals are made from real food, clean ingredients, and organic products, it seemed like a reasonable amount for our financial and health goals. Shop with blinders. Costco is the kind of store that sells foosball tables next to soaker tubs. Everything is bright and shiny, and paying for the yearly membership makes you feel like you have to buy it here in order to get your money’s worth. Some of these labels are great, and I’m glad Costco carries products like this. But organic doesn’t mean salted caramel popcorn is healthy or real food. Enter Costco with a list, or at least a very good idea of what you need, and stick to it. Don’t forget to add the caramel popcorn, because it is delicious. Based on our town and what I pay at other stores, Costco has some of the best prices on a bunch of organic, grass-fed, etc., real food. Here is what we routinely bought at Costco. Organic canned diced tomatoes – I forget how much this actually is because I haven’t had to buy it yet. But beleive it is the best price in my area! Avocado oil – I forget how much this actually is because I haven’t had to buy it yet, but it is by far the best price in my area! Not food related: Paper products are great prices at Costco! We are fairly brand-loyal when it comes to these things (we have opinions on toilet paper, whatever). We tried the Kirkland brand of tissues, paper towels, and toilet paper, and we are happy. Also, organic laundry detergent, soft picks, and gas. If you are not looking for organic or non-GMO labels, Aldi beats Costco prices for nearly every conventionally grown or processed product. I did not buy raw honey there, because I try to buy it in bulk from a local farm in order to get maximum health and price benefits. If I’m going to pay through the nose for good honey, it had better be good. Do not shop with blinders. Do not go with a list. Buy all the trendy foods. There are enough “gluten-free” and “non-GMO” labels to crash all your financial dreams. If you want to see every post I wrote about this experiment, go here. You can also read my #CheapHealthyCostco posts on Instagram here. Are you trying to eat more organic produce and meat? Do you live in an area without local farms and farmers markets with bulk buying options? Do you go through a lot of toilet paper? Do your kids eat like they have tapeworms? Do you like salted caramel popcorn, but want it to have “organic” in the title? These are all valid reasons to try a Costco membership. At the time of this writing, Costco has a money-back guarantee, which I understand to mean that if I try the membership for a while and don’t like it, I can ask for my money back. So there is no risk in at least trying. Will We Keep Our Costco Membership? Now that our experiment is over, we have a choice. Do we keep the membership or do we ask for our money back? On one hand, we have eaten more organic than we ever have in our lives. And we did not increase our budget one penny. This is awesome. On the other hand, I don’t know that I want to keep eating that way. I like trying different foods, and eating all organic kept our budget pretty tight. For now, we will keep the membership. But I wonder if we will use it much in our next experiment. The holidays are coming. Even though we keep a tight reign on gift-buying in our little family, the extra travel and extended family gift exchanges make this an expensive time of year. To prepare for that, I am compromising a little on our general food practices. For the next month or two, we will not try to eat organic, non-GMO foods. Instead, we will focus on simply eating whole foods – apples, lettuce, beef, eggs, plain yogurt, etc. – from the least expensive sources we can find. The goal will be to see how cheaply our family of 5 can eat without worrying about special labels – just eating generally good whole foods. The reality is, that is where a lot of us sit right now. We just need to eat whole food, and we need to do it cheaply. I haven’t decided on a weekly budget amount yet. We are a family of 5 big eaters. High metabolisms, fitness-driven, and very active boys. We also need to eat moderately gluten-free. If we spent $150/week on organic, grass-fed, (blah blah blah), foods, what do you think is a reasonable budget for this experiment? I’ll ask Facebook, Instagram, and the Cheapskate Cooks List. We will settle on a good amount together! This was a great read! We’ve had our Costco membership for just about a year and I’ve been trying to decide if I should keep it or not. I typically just do 1 Costco run per month and that’s to stock up on organic meats, frozen veggies, paper products, butter, and eggs. I love how your able to feed your large family such healthy foods and still stay within your budget!! Thanks, Jennifer! I think if you’re trying to eat a lot of organics, Costco is a really good option. And the paper products help a lot too! Lots of good information! The prices at Costco are great, but it’s so easy to go overboard and so stressful to fight the crowds. We just go once a month and that is mainly for the paper products, the cat liter and the coconut oil and olive oil. Oh, and the kerrygold. For me I find that Trader Joes works better for meat and Ralphs for fresh produce. But it’s just my husband and I so I don’t feel the need to buy in bulk. Awesome! Every time we hit Costco on a weekend I rethink my life choices. I am curious about your next challenge. I had been eating mainly organic, yada yada. Recently a friend whose daughter is studying nutrition told her mom that the things that matter most are not the dirty dozen (cross contamination j, but meats, dairy and egggs. I buy into it somewhat, because things like oats are not necessarily GF, due to cross contamination. The way crops are planted, it really is kind of a crap shoot. I agree! The first quality foods we tried to prioritize were meat and eggs, and later dairy. It’s hard to sift through and decide what’s right.